Vacuuming is an important step in rug maintenance. Vacuuming removes the surface dirt, dust and other soil. Though it might seem to be a fairly simple process - turn the vacuum on and move it back and forth on the rug - there are a few tips to ensure a successful vacuuming session that does not do damage to your rug. Take care when vacuuming over rug fringe - the fringe can be easily damaged. Be sure to use a vacuum with adequate suction power. If you notice a decrease in suction, check the vacuum bag or canister (in bag less models) and the filter(s). Clean or replace as necessary. A HEPA filter on your vacuum will help keep dust out of the air in your home. Vacuum in a methodical manner - slowly covering every inch of the rug at least twice. Rotate or move rugs every now and then. In heavily trafficked areas rugs wear quicker, portions of the rug regularly exposed to sunlight may cause uneven fading. By simply changing the position of a rug, or turning it, you promote even wear. Treat stains and spills as soon as they happen to prevent permanent staining or discoloration. Use a paper towel or disposable gloves to pick up and remove any hard matter. Blot up liquids using a clean, dry white towel. Take care not to rub. If gum is stuck in your rug, freeze it with an ice cube and then pick it off. Depending on the size of the piece of gum, you may have to repeat the process more than once. Club soda is a handy stain remover - just be sure not to use too much! Over-wetting a rug makes it hard to dry and may lead to other problems. Baking soda is another common household product that can be used to clean a rug or carpet. When you're faced with a red wine stain or other dark colored stain, apply a paste made of baking soda and water, wait for it to dry and then brush or vacuum away. Baking soda is also the solution to unpleasant odors emanating from your rugs. Just sprinkle some on and then vacuum. The odors disappear. Be extremely cautious when introducing any cleaning product - homemade or off the counter. Perform a patch test on the underside of the rug or on a portion that is not usually visible, just to make sure that there are no unexpected side effects. 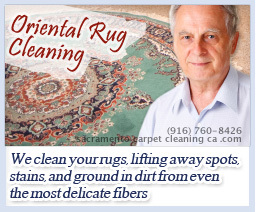 Have your rugs professionally cleaned by Sacramento Rug Cleaning as needed, or as recommended by the rug manufacturer. 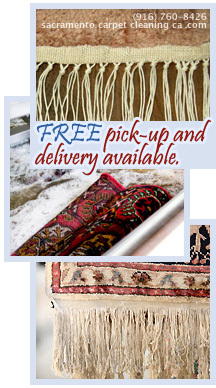 Rugs in homes usually need professional cleaning at least once every two years or so. Rugs installed in offices or commercial buildings often need more frequent cleaning for better eye appeal and better wear. When it's time to have your rugs cleaned, call Carpet Cleaning Sacramento at (916) 760-8426 and ask for a free no-risk estimate. 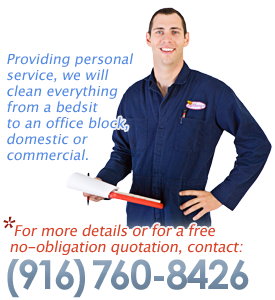 Be sure to ask about how you can save time and money by creating your own personal day of custom cleaning.